Hope you had a great Canada Day my fellow Canadians and, to my American readers, hope your Independence Day is fabulous! We had such great hot weather here that it was hard to get all the jobs done but I did get this accomplished. I’m thrilled with the little brightness it adds to this dark corner. If you don’t remember this is how it looked before the mini makeover. And it brightens up this corner perfectly. And if you were really paying attention, you’ll notice that I also changed out the hardware. 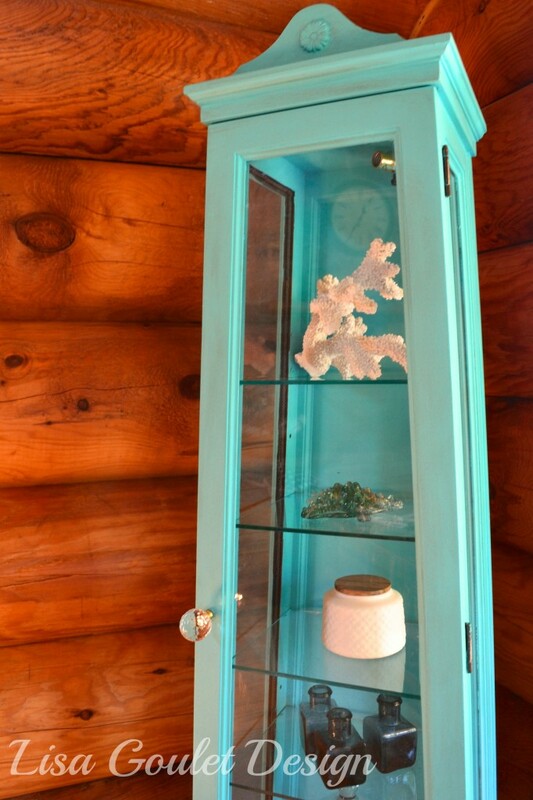 I had a cute crystal knob on hand that I used on the top door. But for the bottom I decided on a tiny brass knob instead of the larger crystal one, it just seemed a tad too big on the bottom door). I also had great fun styling it. 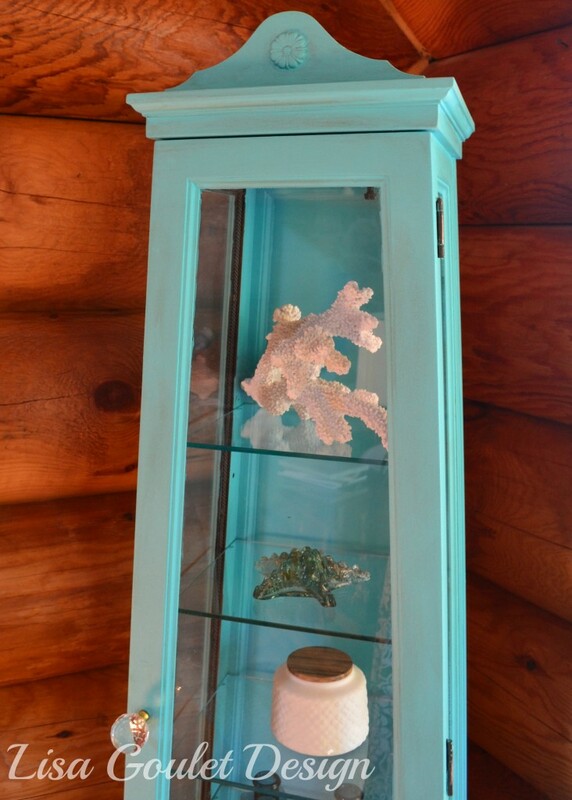 Some faux coral, a pretty glass aqua starfish, a little white canister from Indigo to add some texture and a trio of small blue bottles I picked up in California last year. I may add some blooms to them as well. 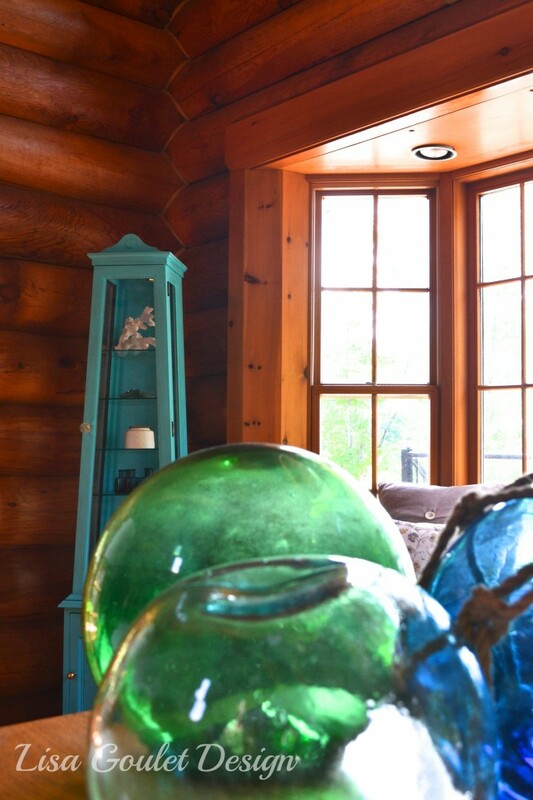 And last but not least a glass dome with some green moss and a few seashells to add to the beachy theme. P.S. 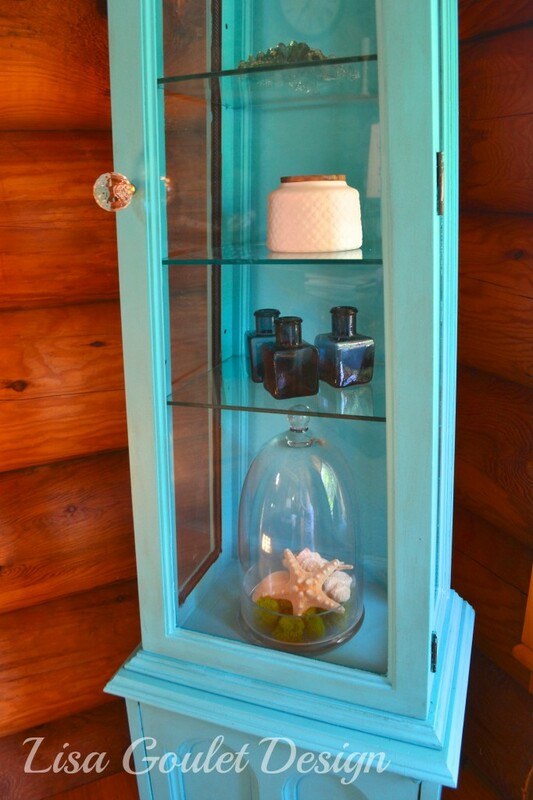 Since a lot of people asked, I thought I would include the recipe for homemade chalk paint that I used for this piece and in these furniture makeovers as well – China Hutch and Buffet (click on the name to read those posts). Here’s the recipe (which I found online here). Mix the plaster of paris with the water, stir thoroughly till there are no lumps. Then add latex paint and mix completely. It should be just as smooth as the plain paint when you started. 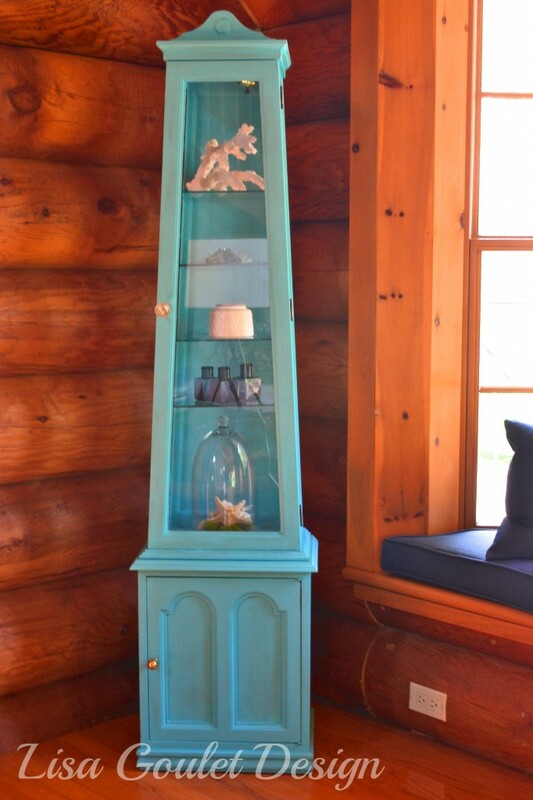 The beauty of chalk paint is that very little prep is needed. I very lightly sanded the piece because it was so dark and then I used a small foam roller to apply two coats of the chalk paint. For the tight areas I used a tiny foam brush, letting the first coat dry for about an hour. I then let it dry completely for a few days, before I applied The Fat Paint Company Wax in antique. I spread a very light coat over the entire surfaces, buffing it to a shine, after waiting 10 minutes. After a half an hour, I used The Fat Paint Company Wax in natural, to cover the entire piece and buff it to a shine, once dry. If more shine is desired, another coat of wax can be used. It goes on so nice and easy with a clean dry cloth. Ha ha definitely Susan! I LOVE a good styling project. Still working on my chalk paint project, but will have it ready for reveal this week! 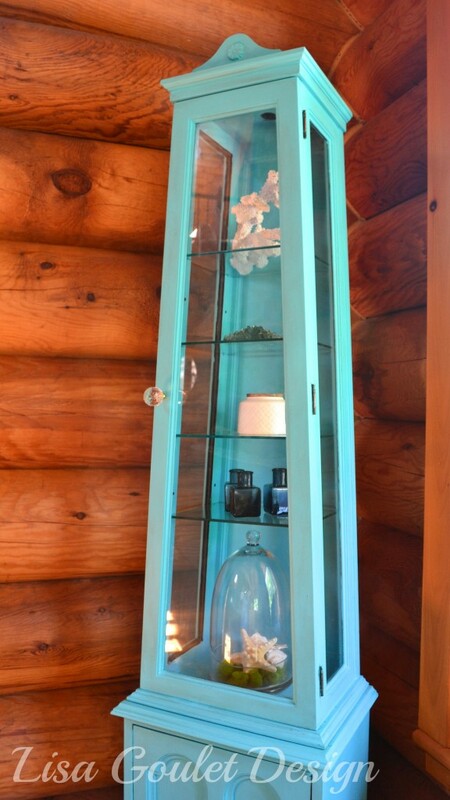 It was a homemade colour, Donna as they were out of Fat Paint’s Caribbean blue so I made my own with Natura’s Cerulean Sea. I used Fat Paint’s Natural wax, which I love. Can’t wait to see your project. Love the colours you are using. What a beautiful colour. You nailed this. I want one now. Very inspirational. Thanks so much for sharing. Thanks Donna. I’m pretty thrilled with the results. It’s amazing what a little colour will do! LOVE IT! What a gorgeous colour. 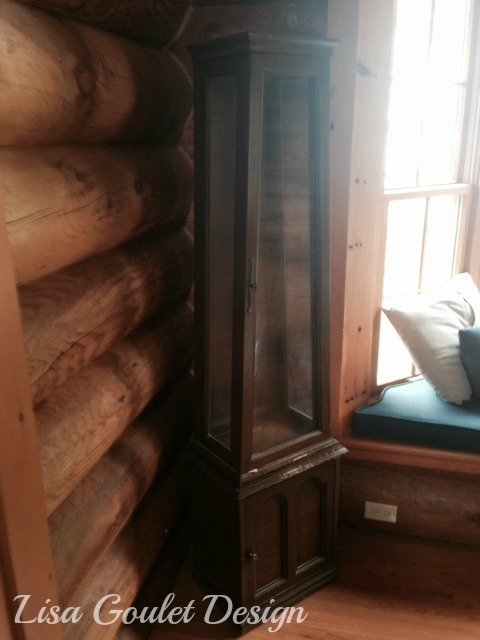 I hardly noticed it in the before shot…and now it’s the highlight of the room. I am dying to paint something this colour now. As Donna said…home made colour or AS? It was homemade chalk paint, as I mentioned to Donna, they were out of Fat Paint in the colour I wanted in Renfrew. It definitely is no wall flower now!